The 8-ton P&H Deck Crane features a four-section boom and includes a job. It has a capacity of 8.5 tons and dual-fuel capabilities; it can run on diesel or propane gas. It has a low-profile cab, easy-to-reach controls, and comfortable seat. 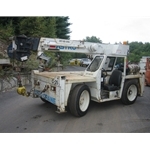 Other features of this dynamic crane include its all-wheel steering and powerful Continental engine. Because of its all-weather design, it’s suitable for use any time of year. This dynamic deck crane features a compact design, making it suitable for use in tight spaces.